A most pleasant and sunny day where we hosted both a Group Drive a Diesel Day and a Steam Experience Day. The oddity was that one of the steam experience clients preferred diesels and transferred to the Diesel Day! Amongst the Diesel Day customers was a driver from Zimbabwe would left the country in 1988 but had fired on their magnificent Garrett locomotives and driven a variety of diesels to the various borders in difficult times proving again you just never know who might turn up. The hosts of the Diesel Day were John A and Richard B and the Steam folk were Mick T and Hylton. All who participated were fulsome in their praise for a memorable day and their hosts. There was a great deal of dmu maintenance, fuelling and cleaning with many thanks to Graham, Will and Anton. There was half a day of progress on the steam shed extension and the Booking Hall enjoyed a steady stream of visitors lured out by the unseasonal weather. Two test customers were booked in encouraging the thought that this part of our business is slowly reviving. The heat wave has nearly reached our part of the world with a warm and pleasant day to help our endeavours. The VCT concentrated on Duffield and the removal of brash from their controversial tree felling site. A generous fire was reported as consuming the brash at a location that didn't trouble anybody. It was a delight to provide a charter train for St Giles School and I thank Lewis, Chris B and John E for hosting this with the active participation of John and Yvonne HT. No 3 was shunted into Platform 1 for the event and the children enjoyed being able to board this engine and the Class 33. Our customer was demonstrating the "cherry picker" in the Car Park providing an added attraction. Rodney opened up Duffield to ensure that end of the line was prepared for the party. The customer, I think, has successfully sold the first model to visitors who attended today and we look forward to further work as a result of their productive visit to Wirksworth. The LMSCA continued their marathon project with the Third Open and the Filing Fairy introduced further order to our paperwork. Work continued with the temporary extension of the steam shed involving drilling of the wooden support posts and digging of holes. The dmu team pursued their quest to winterise the fleet with more antifreeze added to cooling systems and the topping up of batteries. No3 was warmed through in preparation for tomorrow's activities and a computer boffin has reconnected Stuart to the world wide web. Another splendid and productive day. It was great to welcome our customer today for a full line test after quite a famine in this area of our activities. The day appeared to be successful allowing the customer to demonstrate the machine to his potential customers tomorrow. Mick T hosted the test and ensured our part of the day was produced to an high standard. The PWT conducted a whole line track patrol and special praise today goes to Ian and Steve who tackled the Wirksworth to Idridgehay section charged with identifying the sleepers that need replacement through the winter. They had a long day which determines that we have an expenditure of some £3k ahead of us. Time for another heart tablet. The PWT regrouped in the afternoon to undertake further jacking and packing of the pointwork recently re-timbered in Wirksworth Yard. The end is in sight and the end product is beginning to look very good. The LMSCA were in action on both the Third Open and their Mark 1 BSK as both projects inch forward. The lone Carriage Cleaner tackled the 3 Car dmu, the Royal Saloon and the Gatwick Express. A mystery surrounds the black feathers found in the Royal Saloon last used by the Black Dog Band - perhaps there are rituals we know nothing about. Our computer and electrical boffins gathered together to fit an uninterrupted power supply to the server room with great success. However, a moment's inattention has severed Stuart's connection to the outside world - solutions are in hand. The Booking Hall is now devoting time to 2012 as enquiries arrive and thoughts are being gathered about the shape of the Year which include the Olympics and Queen's Jubilee. A new version of the stock list is available for download in the usual spot (Enthusiasts section of the website). Most notable change is the reintroduction of D8001 as it has now returned to us. A pleasant day but the forecast heat wave still hasn't quite reached Wirksworth but we live in hopes. The VCT headed for Duffield to clear the brash from their previous felling operations achieved at the request of a neighbour. It would seem that a full consultation with fellow neighbours had not taken place leading to some uncalled for strife for our team! Nonetheless, progress was made with disposing of the brash. The DST concentrated on Henry Ellison with the lubricator and sand pipes being fitted today. I am pleased to report that Dave Williams has assumed the role of locomotive foreman for No3 to ensure its maintenance and presentation is up to scratch. 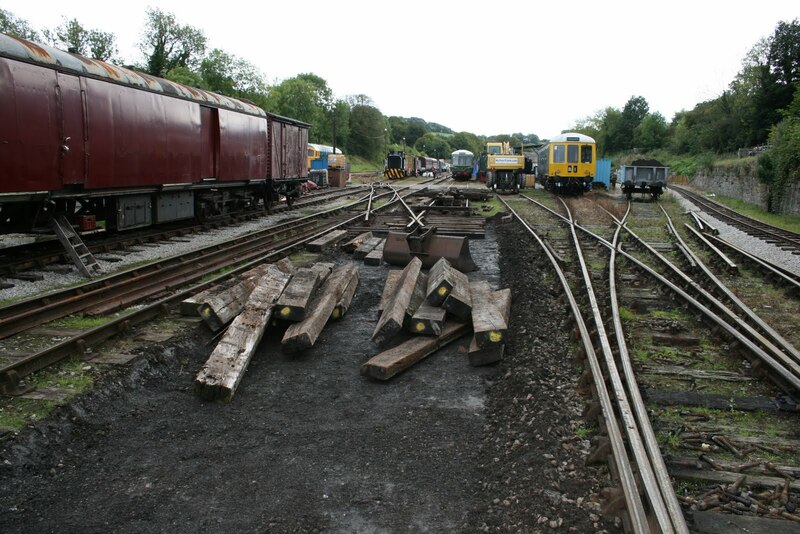 The PWT concentrated on jacking and packing the newly retimbered pointwork at the north end of Wirksworth Yard with further work before them as the week proceeds. The LMSCA upholsterer tackled a job on dmu 50599 to repair a seat back. The remainder of the LMSCA team spent their day tending to the Third Open after their most successful participation in the LMS celebrations at the National Railway Museum over the weekend. Mike the Flail made further inroads to the area between Callow Park and the Derby Road bridge to the south of it. This area is beginning to look good again after the attentions of our neighbour there. The Head of Gardening continued with the Wirksworth Station garden and the Booking Hall was beginning to attack the potential Santa market. A machine was delivered yesterday that will be tested tomorrow and demonstrated to potential customers on Thursday. Much progress round and about along side a reasonable passenger service. The LMS brake van, now shedded, had work undertaken on the sides and the 8F group seemed to ratchet inside the boiler of Henry Ellison all day literally. The DMU team went through the winterisation process for the coolant system and attacked the rest of the old ceiling in 51505. It was nice to see the Class 20 Locomotive Society back at Wirksworth polishing their refurbished power unit! A new entrants induction took place to welcome five more lucky people to our enterprise. Quite a lot of dmu activity today as vehicels were prepared for the weekend. Leigh wrestled with the lighting in 51505 that seems to require some reconfiguration to make presently available fittings work in an heritage environment. The recently acquired Wirksworth mower was put to work and the displays of plants were watered at Duffield and Wirksworth. The Booking Hall received a number of visitors brought out by a relatively pleasant day. PS - A photo of today's mystery object is attached - donated with a suggestion that it was recovered from the Mickleover area. 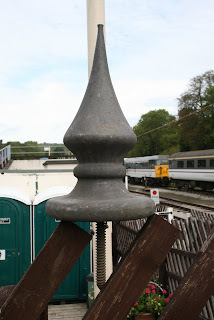 Does anyone have an an idea as it does not seem to be of railway origin. It is a metal rather than the traditional wood. A lower turnout today but the VCT was strengthened by a couple of new volunteers and concentrated on clearing the vegetation around Cemetery Lane bridge with one large fire to burn the brash. A two man PWT changed some broken slide chairs on the newly re-laid pointwork at the north end of Wirksworth Yard. A little shunting was achieved following repairs to the Works Train brakevan footboards being completed. Graham resolved air leaks on L J Breeze and combined with David N to restore the fuel pump to health so that it measures dispensing of this expensive liquid again. The Booking Hall continued the good work of seeking new revenue opportunities. A quite large PWT team loaded materials south of the Wash Green bridge released by the removal of the old trap point consisting of track components and timbers. They then went on to "screw down" the recently relayed pointwork at the north end of the Yard and reinstate it for use. Next week will see the refurbished installation jacked and packed to complete the job. This endeavour has occupied a lot of time and effort but very necessary to prevent any mishaps with very old materials. We had a delightful Drive a Diesel Day customer from Bridlington accompanied by three of his sons. It transpired he was a former signalman having a feel for railway operations and enjoyed meeting up with his sons one of which had a passing knowledge of the Marchwood Military Railway. Lewis and Richard again proved themselves as very good hosts and Angela looked after the inner man at lunch time. As ever, we try and provide meaningful work during the morning and the Class 33 and Saloon were shunted to Platform 1, the Saloon being required for additional catering accommodation on Sunday. The PWT continued the shunting operations during the afternoon that included placing Tim's brakevan in the Maintenance Facility for fast track timber replacement and various other vehicles in position for their next part in our continued development. The lone carriage cleaner dealt with the exuberance of party goers in the Gatwick Express last weekend and gave Iris a "do". We constantly seek a companion for this lonely and vital work without success - so far. The Booking Hall tended to our visitors and continued the quest for more group bookings. The VCT made for Duffield and felled the last of the Stanier trees and then transported the brash from this and previous activities to a burning site near Hazelwood reporting a very large fire. The PWT chased them south with many tasks achieved including the transport of a "Portaloo", wagons assembled for loading at Wirksworth tomorrow, fence panels delivered to Gorsey Bank, logs for sale at Wirksworh and specialised chairs for the point work renewal at base. The DST carried on their work with Cathryn and Henry Ellison and the Booking Hall benefited from a new coach group booking in mid October that includes travel and catering. The LMSCA continued with preparation for their starring role this weekend at the National Railway Museum and the lights along Platform 1 at Wirksworth were checked and replaced as necessary. Attempts were made to restore our fuel pump to measuring the amount dispensed to the various vehicles we use without success. Fuel is now costing some £800 a fortnight and we desperately need to know where it goes. This is a mechanical measure and if any of you has a possible replacement piece of equipment I would be delighted to hear from you. A peaceful autumnal day allow paper to be moved around the desk and a few enquiries to the Booking Hall. The main event has been the return of an "old" friend in the shape of D8001. For a change we turned the locomotive in the Car Park so that the cab faces north this time. More photo opportunities! Rain threatened all day but held off until our guests completed their enjoyable Group Drive a Diesel Day ably hosted by Richard B and John A. Lunch provided by Angela was appreciated and the participants guests were able to enjoy a whole tour during the afternoon. The LMSCA continued their endeavours with the Third Open and we welcomed a customer for brake testing in the morning. Dmu maintenance featured through the day with the newly put together three car set receiving further cleaning inside and out. The two car set was coupled together and tested as a standby set and my thanks go to Leigh and Rob who conducted these range of tasks. A delightful arrival was a new supply of flags produced for us by Ann Stewart of Edinburgh as a joyful and welcome donation. Both Catering and the Booking Hall spent a great of deal of time preparing for the upcoming Military Weekend. Quite a pleasant sunny day with much energy being put into the dmu fleet. Our three car set has been re-formed to include two guards brake van areas ready for a commission we are undertaking together with ensuring it is in the right configuration for our Santa trains. This has been quite a task and occupied a long day for the team. We also have an embryonic two car set together with two single units enabling response to various levels of passenger demand. A charter was provided today for a somewhat smaller group than was otherwise expected but those that did attend enjoyed the hospitality of Chris B, Patrick and John E together with a buffet lunch provided by Angela. Some extra catering sales were made to visitors arriving speculatively to Wirksworth Station. The VCT responded to a minor emergency at MP 1391/4 where the charter had encountered a fallen tree and I am most grateful to them for preventing further paintwork damage to Iris. Their main task had been to remove four fir trees near Duffield for Mike Stanier, the grandson of the great man, and three were successfully dealt with. The LMSCA were in action on the Third Open and the Booking Hall concentrated on shaping the rest of the year for our web site. The planned Class 33 weekend in October required a few tweaks to get the Sunday operation right and capitalise on East Midlands Trains connections and our last departure for the Saturday of the Model Railway Weekend was reviewed resulting in an extra late train that will double up as a fish and chip special. Santa trains are now all on the web site with the new opportunity to sample Duffield departures - your childrens' desires are just a click away! 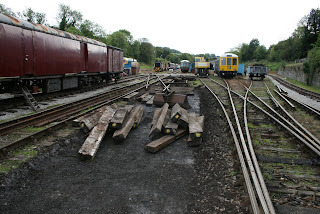 The PWT continued with their quite major job to renew the timbers under pointwork at the north end of Wirksworth Yard. There is still work to be done next week that will depend on the number of people that attend. A few exciting announcements for October. Firstly (and only by date, not by excitement factor), we are pleased to announce an additional service on the Saturday of the Model Railway Exhibition Weekend (15th October). This service will depart Wirksworth at 18:20 and return from Duffield at 19:10 allowing visitors with ordinary tickets to travel home from the event. However, this service will also be our first Fish and Chip Special service on the Duffield line. Advanced booking is essential and should be done by e-mail to this address: ticketoffice@e-v-r.com . Please include your name, contact number and the number of people you would like to book, then indicate whether you would like Sausage and Chips or Fish, Chips and Peas (these are the only two options available). Tickets cost £5.00 each including the food on top of an ordinary ticket payable on the day. Bookings will be taken on a first come, first served basis and are open to all. The food will be ordered in the afternoon and will be freshly cooked by Town Street Fish Bar of Duffield. This is the first time we have tried this in this format so why not come along and try it? Secondly, the timetables for the Class 33 Debut Weekend on 22nd/23rd October (along with information on the above) are available on the website now at http://www.e-v-r.com/eventinfo/ . We have a special timetable in operation on the Sunday to allow 33035 to run some services on the 1 in 27 Ravenstor incline. A welcome return to MTT activities as today's customer put three vehicles through brake tests in Wirksworth Yard with the fourth due on Friday. The LMSCA continued their work on the Third Open and our lone carriage cleaner tackled the 3 car set and Iris to very good effect. Mike Billing set off to tidy, as best he could, the activities of our neighbour on the "racing straight" reporting good progress. It was lucky that he was the first movement south of Wirksworth since the high winds of Monday as a tree had been blown over onto the track in the 40 steps area. The Komatsu was able to place the tree ready for logging and clear of the line. The PWT achieved a whole line track patrol, tightening fishplate bolts as necessary, and noting defects to be attended to through the winter. This age old tradition which I guess originated in 1825 still has an important role in the 21st century. There was burst of gardening at Wirksworth and the newly installed post at Gorsey Bank painted. The Booking Hall started to turn its attention to the Santa season with preparations to mail out to previous years customers. It will soon be Christmas! The PWT weighed into the pointwork renewal at Wirksworth after their patrolling to give a kick start to tomorrow's endeavours. PS - I am extremely pleased to report that Pat and Mike Craft are now proud parents as eight puppies have been added to their recently acquired rescue dogs. They need hand rearing with a feed every two hours - don't you envy them! Firstly, many thanks who made the Festival Weekend work well for us with its experimental early and late trains. The end product was a curate's egg with some successes and some failures in terms of passenger numbers. Nonetheless, the concept has been established and with a little more energy this will work better in 2012. Thumbs down for the Festival organisers who promised there would be no catering at the top of the Station Approach only to let a tea and coffee outlet in that spot during the weekend. Thumbs up to Angela who tried to counteract this with a barbeque on Saturday but retired hurt on Sunday. Thumbs up, again, to Matt who provided a catering trolley on our Duffield services that was much appreciated by our passengers and thumbs up to John Blackmore who, almost, single headedly manned the car park parking point as well as selling Festival Trail badges raising a gross £900. Back to today which has been another very busy day for our enterprise. A post has been established at Gorsey Bank to fix the switch for the level crossing lights as the previous fixing had been removed during the renewal of our neighbours fence. The PWT continued with the major task of renewing the connection between 1 and 2 roads at the north end of Wirksworth Yard and the LMSCA continued there major task to complete the Third Open. The VCT maintained their quest to cement relationships with a special neighbour in Spring Close reporting the work complete with a two fire day. The DST have been seen working on three locomotives with the water tanks being primed on Henry Ellison and Cathryn, two front buffers fixed to Henry Ellison and No3 receiving full maintenance for the upcoming weekend. On the domestic front the Filing Fairy made strides with our records, Fred and Iris gave the Mess Hall at deep clean and Dorothy dealt with unpleasant toilet blockages. Three cheers to these people who ensure we can survive without contracting serious diseases! Vegetation treatment was undertaken to the north of Cemetery Lane and we were pleased to welcome a team from Network Rail that stripped the foliage from bridges DJW4 and 5. Rodney reports a tidy and grass cut at Duffield and John Snell reports on his attendance yesterday at a DVLCRP meeting where subjects included a safe cycle route from Wirksworth to Carsington, widening of the Derwent Valley guide to include heritage railways, support for our services to the Wirksworth Festival in 2012 and an introduction to East Midlands Trains new Route Manager. PS I enjoyed a day in Manchester yesterday and, amongst other things, travelled the north end of the Midland Main Line. The last time I had experienced the route was behind 45705 Seahorse working the 1705 Manchester Central to Buxton! Nowadays it is on board Metrolink as far a St Werburg's Road, the former junction for the CLC line to Fallowfield and Guide Bridge. Nonetheless, you do get the sense of heading down a main line, perhaps Metrolink will extend to Matlock and Derby. After all it's now managed by RATP and they must want to connect with Paris at some time. without the challenge of parking amongst the multitude thronging Wirksworth. torrential downpour. There is no accounting for taste. A fantastic day for Wirkswirth Festival with reasonably busy trains, including early and late trains. The platform hog roast sold out!! The 1910 off Duffield postly served as a "route learning" first class ride for the 33 group. The DMU team had a rampant day replacing an exhauster on 55006, putting new electron storage systems onto the 108 and 2nd glossing the new ceiling on 51505. The 8F group, LMSCA and brake van posse also were in attendance. Quite a day, yet again, with the batteries for the level crossing lights at Gorsey Bank and Idridgehay exchanged and the hand wash hot water machine in the Buffet Car restored to health. All these behind the scenes essential work that keeps the show on the road. There was a superb turnout of Class 20 drivers and dmu drivers for a course run by the Premier Diesel Group to acquaint them with the Class 33. This was most professionally organised and was of great benefit to all involved. The day consisted of class room work, static practical explanation of the locomotive's features followed by a hauled run to Duffield and back using the three car Met-Cam set. Many thanks go to Angela who supplied the participants with sandwiches and soup for lunch. This was integrated with a charter from Duffield to Wirksworth and return with the participants visiting the Wirksworth night spots during their stay with us. The LMSCA have continued their work on the Third Open and much energy has been expended on trying to revive the Talking Tunnel. The same team prepared the timber that will repair the step boards on the Works Train brakevan. Further excitements associated with the Wirksworth Festival were installed in the LMS Brakevan and Training Room. The Booking Hall looked after our Festival guests and prepared for what one hopes will be a lively weekend. A lot of activity for a Friday. A delightful team effort saw a warm welcome for the Chaddesden Historical Group journeying to Duffield and Ravenstor and then consuming a great number of bacon butties in the Buffet Car before proceeding to the Narrow Gauge to complete their day. They also shopped in the Booking Hall staying over an hour after their scheduled departure. Thanks go to the train crew of Lewis, Patrick and Mike Evans.Angela excelled in the Buffet Car together with Leigh in the Booking Hall. JHT and Matt ensured the Narrow Gauge was in business. It was a great way to show our enterprise off to a group of very interested and pleased passengers. Rodney provided welcome refreshments at Duffield. The heroes of the PWT battled on with retimbering pointwork in Wirksworth Yard together with effecting repairs to the catch point that protects the Wirksworth to Duffield section. The scale of the challenge can be seen in the accompanying photo emphasizing no track - no trains! During the Dash for Duffield many maintenance requirements were put on hold and a period of catch up is now necessary and a thought should go to those that enable us all to ride the rails. The LMSCA continued with their Third Open project and commencement was made with the dmu winterisation programme. The VCT dealt with a request by a new neighbour in Spring Close, Wirksworth to relieve her concern about overhanging branches that might fall on her car and received grateful thanks for being good Samaritans. Two fire beaters were also constructed as a precaution against a long hot winter. Continued work carried on to finalise the arrangements for the upcoming Festival Weekend. A gloomy, wet day that tested the dedication of our PWT. Nonetheless, they made steady progress with the quite major project of renewing the timber supporting pointwork at the north end of Wirksworth Yard. During the day the LMS Brakevan was moved to Platform 1 to perform its part in the Wirksworth Festival, the end product is yet to be revealed. The lone carriage cleaner tended to the three car set and was somewhat concerned by the condition of the windows. I remain ever grateful for this most essential work that presents our trains in the best light. The Booking Hall concentrated on the necessities of the upcoming Festival weekend where there remain many vacancies for all the tasks required. The success of this weekend , or otherwise, is in your hands! On a positive note we have passed a significant milestone in that our turnover has exceeded £200k for the first time in history. Not a lot by the standards of the larger contenders in the heritage railway movement but of great importance to us. Turnover, of course, does not represent profit but is a guide to where we are going. As has been said " turnover is vanity, profit is sanity". Nonetheless, the results do indicate that everything is going in the right direction and we can begin to save for further capital works that will occupy us for the next few years. PS - I am sure you will join me in wishing Peter Taylor well as he prepares to enter hospital for the removal of a kidney. I have suggested that hospital food has greatly improved and his reply was less than appreciative! Now that the summer holidays are over and the nights are drawing in, why not book yourselves onto something to look forward to? Check our Santa Specials in December which promise to give a fun time for all! ...and for the first time, you can book online on our Santa Specials page. The VCT set off to tackle the end products of our rather unusual neighbour alongside the "racing straight" who has demolished trees by large digger and left us with quite a mess to clear up. The area between bridges DJW 21 and DJW 20 was dealt with involving 3 large fires to burn brash but logs were a bi-product of this activity that should benefit us. The DST report servicing of No3 and its injectors, further dismantling of Cathryn's motion and Henry Ellison's clack valves. The Booking Hall processed further group bookings and enquiries and I am grateful to Patrick, Graham and Matt for turning out to run an evening charter together with Angela who is returning out to provide an "Afternoon Tea" at around 2100hrs this evening. Also many thanks to David N who journeyed to Doncaster to collect essential supplies for the relaying work in Wirksworth Yard. As ever, underestimated the webmaster! Festival timetables are available now on the web site. A blustery wintry day that gladdened the heart and demonstrated all the good things about our enterprise. Four Drive a Diesel participants arrived from distant parts, Gatwick, Leamington Spa, Halifax and Borrowash to enjoy a day with their hosts, John A and Richard B. They left us converted to the EVR and will be ambassadors for the Railway for the foreseeable future. It is a great product for illustrating what we have achieved and what we can now do. My thanks go to their hosts who really sell our unique take on life. Their lunches were provided by Angela and much appreciated by all the team. Dynamo belts were fitted to the centre car of our 3 car set which seemed to take a long time and be a very dirty job with Graham particularly affected. The Booking Hall received our visitors and an inordinate number of phone calls relating to future bookings, amongst other things, which would suggest the remainder of the season will be quite lively. 60 members and supporters of the Black Dog Band have been booked in for lunch at the end of September to celebrate the launch of their new album in the hope that the windows of the Gatwick Express can cope with the pulsating beat. There have been some very sensible changes to the Duffield to Wirksworth timetable for the Sunday of the Wirksworth Festival and these should be on the web site tomorrow. A modest kind of day on the passenger front but with some very posituve comments from the DWAD and the gaggle of EMT drivers sampling our line. Around the yard, the Hair and Higham began taking the motion off Cathryn, the LMS Brake Van had one side removed, the DMU team painted the ceiling on 51505 and cleaned the trim, the Duty Conscript undercoated the main gate and the Gorilla gardners attempted to get on top of their overgrowth. The paint store received a donation after taking 72 hours to tidy and half a Grampus was painted. At Duffield, the lawn was cut. A reasonable day passenger wise which saw a 90th birthday train trip and private party in the Gatwick Express, excellently laid on by the catering department. Down the yard, the DMU team plimped up the beading trim that covers the edges of ceiling panels in 51505. The 8F group were working on the boiler of Henry Ellison. The LMSCA were in attendance working on the body of the TO. Firstly an omission from yesterday where the computer boffins fitted an Uninterrupted Power Supply to our server following irritating downtime each time we have a "spike" in our electricity supply. Further work was achieved in trying to ensure the Buffet Car till talks to the server. All this endeavour is designed to eradicate annoying problems in achieving a stable collection of data. The running of two tills has occupied an inordinate amount of time and money but hopefully we are on the last lap. My thanks go to Chris and Leigh who have persisted with this elusive goal. Today saw a Group Drive a Diesel day most ably hosted by Lewis and Mick T. Glowing praise by the participants coupled with pleasant weather ensured we have new friends and advocates. The LMSCA had a good day sourcing components to continue their work on the Third Open and then went on to continue with the project. The Booking Hall welcomed the Drive a Diesel Day clients and a number of other visitors brought out by the sunshine. I am most grateful to Anton for organising and producing lunch for the BuyaGift customers in addition to his normal activities of preparing for the weekend. The first day of the 9th month of the year was surprisingly pleasant and warm aiding today's endeavours. The VCT were somewhat frustrated by all lines through Wirksworth being blocked by essential work on the permanent way. Nonetheless they attacked the Incline and defoliated bridge DJW27, the Cromford Road bridge, which was a useful component of the programme agreed with Network Rail prior to their contractors undertaking a full survey. They achieved the traditional fire to burn the resultant brash. The PWT continued their work to ensure that the single slip is safe to operate over and made good progress. There is still work to be done which will be attended to next week but caution is necessary in the intervening period. Karen presented her final version of a map of our facilities at Wirksworth that she had been asked to produce for our visitors but particularly useful for the participants of the planned St Pancras to Wirksworth charter train (change at Duffield) on 13th October. Our team of Graham, Patrick and Will entertained a group charter with many happy customers enjoying the hospitality provided by Rodney at Duffield. A lone dmu team member worked on sealing the vents on vehicles 51505 and 50599. Essential work to provide the right environment for our passengers. The Booking Hall welcomed our charter passengers and several other visitors brought out by the mild weather.